In the office of an international conservation organization in Myanmar, the passionate staff are eager to show me a video from one of their camera traps. I watch in awe as a huge, grey, wrinkly elephant ambles into the frame. It tentatively sniffs another camera trap, a metal box strapped to a tree, with its trunk. And then, it deliberately raises one leg, and STOMPS the camera with its massive foot, completely destroying it. But rogue elephants aren’t the only challenge for conservationists hoping to conduct biodiversity surveys with camera traps. At least 23 cameras have been destroyed or stolen by local people, much to the frustration of project staff. I’m no elephant behavior expert, so I have no idea what motivates a grey giant to destroy expensive research equipment. But what about local people? 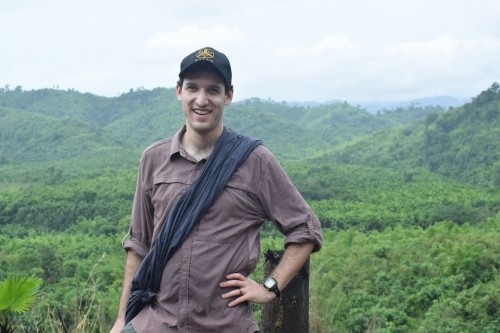 I’m in Myanmar this summer for my Yale School of Forestry and Environmental Studies master’s thesis research, which draws on political ecology to explore the controversy over a proposed national park in southeast Myanmar, and its potential impact on the customary land rights and livelihoods of indigenous Karen communities. Using qualitative social science methods including semi-structured interviews, document analysis, and participant observation, my research uncovers how different actors construct multiple visions of the same landscape, leading to conflict over the proposed national park. One of my tasks has been to critically examine the role of conservation technologies, such as camera traps, in this conflict. Conservationists working in the park see camera traps as technical research tool for producing objective scientific knowledge. By analyzing data from hundreds of cameras placed in 4km X 4km grids throughout the proposed national park, they can estimate the population density of tigers, elephants and other endangered species. These estimates can then be used to guide conservation interventions that aim to protect globally important species. Camera trap biodiversity surveys are presented as neutral and apolitical. Conservationists believe that when local people destroy a camera trap, it’s because they don’t understand what it is, and are afraid. However, Karen villagers in the area tell a different story. They know full well the purpose of the camera trap survey and they are concerned about what data on endangered species might bring down the line – establishment of a national park. Villagers worry that if a national park is established in their area, they will lose access to the forest resources and customary agricultural lands they depend on to survive. Because of these concerns, they express searing anger that conservationists have placed cameras on indigenous peoples’ territory without first asking permission. For local people, camera trap biodiversity surveys are a highly political undertaking, with serious implications for their autonomy and self-determination. They see camera traps not as a neutral, technical tool, but as part of the ongoing efforts by the Myanmar government to expand its territorial control into contested areas in the Karen borderlands. In this way, camera traps in Myanmar reflect what anthropologist James Ferguson (1990)* has termed “anti-politics.” These supposedly neutral, technical tools obscure the highly political nature of international conservation projects in Myanmar. Understanding the anti-politics of conservation technologies such as camera traps will be crucial for resolving conflict over protected areas. Thanks to the MacMillian Center’s Council on Southeast Asian Studies and Council on East Asian Studies, as well as the Tropical Resources Institute at Yale University for their financial support of this project. *Ferguson, J. (1990). The anti-politics machine: “development,” depoliticization, and bureaucratic power in Lesotho. Cambridge, Cambridge University Press. Written by Jared Naimark, a Yale School of Forestry & Environmental Studies graduate student.